Speed Date Your public Officials! Grant your heart's desires and meet some real, live politicians! The MYPO (Meet Your Public Officials) Mixer and Fundraiser will kindle your romance with democracy. On April 5th, whet your appetite for politics as you mull over a scrumptious array of beer, appetizers, and public affairs. See the faces behind the ballots, hear what they have to say, and, depending on how impressed you are, judge and/or praise your neighbourhood's political acumen. Mingle with Trish Herrera Spencer, mayor and mother of four. She won't let anything get in her way of creating a smarter and greener Alameda! Hang out with Councilmember Marilyn Ezzy Ashcraft, who will win you over with her smile and determination in keeping Alameda's hospital open and libraries robust. With so many candidates waiting to get to know you, who can still claim that America's romance with local government is dead? Once you exhaust your extrovert batteries, you can sit back, nurse your drink, and participate in silent raffles. This year's grand prize is (drum rolls, please) a Deluxe Walt Disney World Resort African Safari Adventure! Valued at $4500, the winner will be able to "escape on their own African safari adventure at this fantastic resort hotel with a dazzling pool oasis and waterslide." Meeting your esteemed representatives shouldn't be anything but a comfortable and relaxed experience. 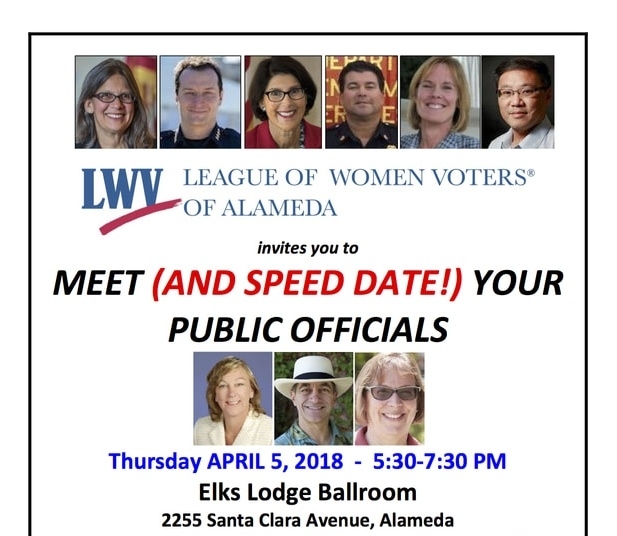 For this reason, the Alameda League of Women Voters has worked tirelessly every year to host this event. Encouraging informed and active participation in the government, the organization also plans socials, scholarships, seminars, and even a book club! The League, which does not support or oppose specific parties or candidates, is open to anyone who is passionate about their democracy. For more information, check out their website here: https://www.lwvalameda.org/. Everyone is welcome! Remember to RSVP and buy tickets here: https://www.lwvalameda.org/calendar.html, The suggested donation is $10. Funds raised from ticket sales and from the raffle help the League of Women Voters continue to enrich the island with events and programs like this one. The League of Women voters is still looking for donations for the silent raffle! Own a business and/or want to make a tax-deductible difference in the community? Please contact Karin Guthrie ([email protected]) or Marilyn Ng ([email protected]) when you have an item/service ready. Don't delay, donate today! The deadline is Friday, March 30.